I am in love with my wedding dress. Everyone at my wedding asked me where I bought it, y'all did a wonderful job i also love the customer service. I'm very happy., with my dress, excellent quality, arrived very quickly, thank you to all his team, excellent service me. I do recommend buying with you, thank you. Amazing dress! Ordered it custom made, worth every penny. The dress fits me perfectly! Arrived quickly, and I love the color, fabric and quality! It's perfect, and I can't wait to get married! I received my wedding dress today and it was just what I imagined it to be. The quality and fit are perfect and I couldn? ?t be happier. Everything was on time and fit perfectly! I wasn't expecting it to since I have a hard time shopping for dresses. But this as perfect! I love it! Definitely pleasantly surprised, and 100% worth it for the price. I received the dress in a short time after i placed the order,My friends said that the dress is suit for my body,and I feel very comfortable when wearing the dress. 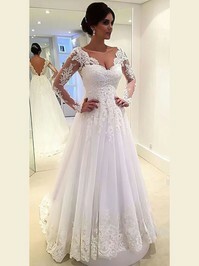 My wedding is coming and it will be in a week.I am so happy that the dress arrived on time so that I can wear it on my big day.